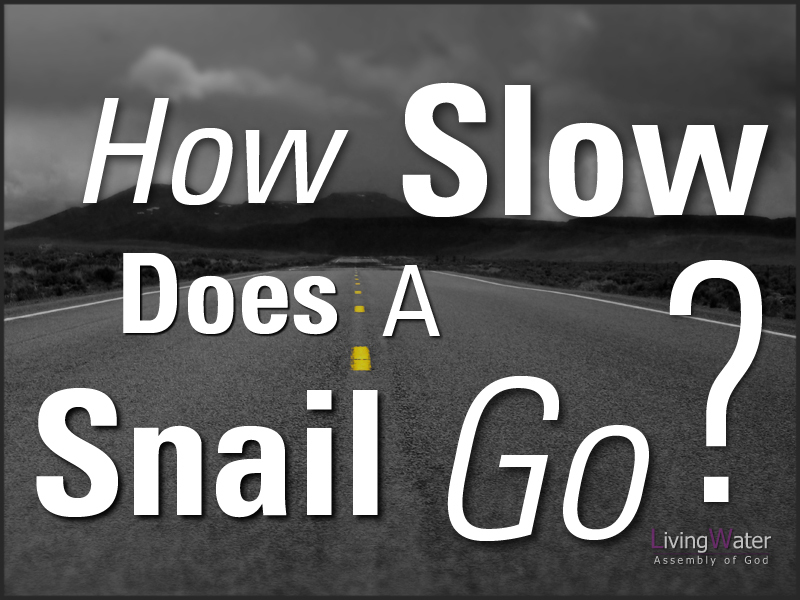 Sermon – Pastor Tim – How Slow Does A Snail Go? Romans 5:1-5, Therefore, having been justified by faith, we have[a] peace with God through our Lord Jesus Christ, 2 through whom also we have access by faith into this grace in which we stand, and rejoice in hope of the glory of God. 3 And not only that, but we also glory in tribulations, knowing that tribulation produces perseverance; 4 and perseverance, character; and character, hope. 5 Now hope does not disappoint, because the love of God has been poured out in our hearts by the Holy Spirit who was given to us. Tribulation: distress or suffering resulting from oppression or persecution. And upon that building block go character and hope. Romans 5:4, and perseverance, character; and character, hope. The original Greek word translated “perseverance” means “steadfastness, consistency and endurance.” It was used of believers who endured in their walk of faith despite many painful trials. Romans 5:5, Now hope does not disappoint, because the love of God has been poured out in our hearts by the Holy Spirit who was given to us. Paul wrote in 2 Corinthians 11:24-28, From the Jews five times I received forty stripes minus one. 25 Three times I was beaten with rods; once I was stoned; three times I was shipwrecked; a night and a day I have been in the deep; 26 in journeys often, in perils of waters, in perils of robbers, in perils of my own countrymen, in perils of the Gentiles, in perils in the city, in perils in the wilderness, in perils in the sea, in perils among false brethren; 27 in weariness and toil, in sleeplessness often, in hunger and thirst, in fastings often, in cold and nakedness— 28 besides the other things, what comes upon me daily: my deep concern for all the churches. Paul goes on to say about his thorn in the flesh, 2 Corinthians 12:8-10, Concerning this thing I pleaded with the Lord three times that it might depart from me. 9 And He said to me, “My grace is sufficient for you, for My strength is made perfect in weakness.” Therefore most gladly I will rather boast in my infirmities, that the power of Christ may rest upon me. 10 Therefore I take pleasure in infirmities, in reproaches, in needs, in persecutions, in distresses, for Christ’s sake. For when I am weak, then I am strong. Have setbacks slowed you to a snail’s pace? Be encouraged. God doesn’t ask for a fast finish—He expects persevering progress. Philippians 4:8-9, Finally, brethren, whatever things are true, whatever things are noble, whatever things are just, whatever things are pure, whatever things are lovely, whatever things are of good report, if there is any virtue and if there is anything praiseworthy—meditate on these things. 9 The things which you learned and received and heard and saw in me, these do, and the God of peace will be with you.